According to classical Buddhist teachings, many if not most of our perceptions are erroneous, and erroneous perceptions cause suffering. “Looking deeply into the wrong perceptions, ideas, and notions that are at the base of our suffering,” writes Zen master Thich Nhat Hanh, “is the most important practice in Buddhist meditation.” And correspondingly, “the practice of throwing away your notions and views is so important. Liberation will not be possible without this throwing away.” Yet, as Thich Nhat Hanh goes on to say, “it takes insight and courage to throw away an idea.” Views we have held for decades–or perhaps for a lifetime–are not so easily disposed of, especially when they appear to have served us well. Broadly speaking, one of the most effective ways to rid ourselves of self-centered, noxious views, such as the view that one’s own race, gender, class, or ethnicity is superior to another, is to reflect deeply on that view’s potential for harm. But a more immediate tool resides in one of the words Thich Nhat Hanh employs above. That word is notion, which has multiple meanings within a distinctive tonal range. Most commonly, notion refers to an idea, view, or concept, but it may also refer to a whim, a hunch, an intuition, or an impulse. In Ireland, notion can mean an inflated sense of one’s importance, social status, or charm. (“She has notions, that one. She thinks she’s it”). * Similarly, in American usage notion is often paired with fanciful, suggesting that the notion in question may be imaginative but not well grounded in fact. As these diverse meanings indicate, calling a thought a notion is not quite the same as calling it an idea or view, much less a firm belief or bedrock conviction. The very word notion implies that the connection between the thought and the reality it purports to represent might be tenuous at best. Where before there was certainty, now there is doubt. Where once we believed our own thought, now we are not so sure. And from the vantage point of meditative practice, that is a fortunate situation in which to find ourselves. For one thing, viewing our thoughts as notions encourages us to step back from them, rather than identify with them or automatically assume their validity. As Joseph Goldstein reminds us, there is a “profound difference between being aware of a thought and being lost in it.”* By becoming aware of a thought even as it is arising, we prevent ourselves from getting lost in it, attached to it, or anchored in it prematurely. And by viewing it as merely a notion, we can more readily see what Goldstein calls its “changing, selfless nature.” Should we find the thought worth pursuing, we can do so at a later time. If not, we can witness the thought’s arrival, duration, and departure and allow it to disappear of its own accord. Reciprocally, by regarding a thought as a transient, insubstantial notion, we can also drain it of much of its power. “A thought is just a thought,” the Burmese meditation master Sayada U Tejaniya observes. But thoughts about matters that deeply concern us–our health, finances, jobs, and families, to name a few–can dominate our minds and erode our equanimity, whether they be grounded in reality or not. By viewing our thoughts as notions, we can learn to give our views and ideas a fair hearing but not take them all that seriously or attribute importance where none exists. The Tibetan master Sogyal Rinpoche advises us to view our “family of thoughts” as children at play. Zen master Koshu Uchiyama urges us to see them as the mind’s “secretions.” Similarly, by viewing even our brightest thoughts as notions, we can release ourselves from their grip. Should we succeed in that effort, we will have opened a meditative space where our thoughts no longer undermine the clarity of our seeing or diminish our appreciation of our daily lives. 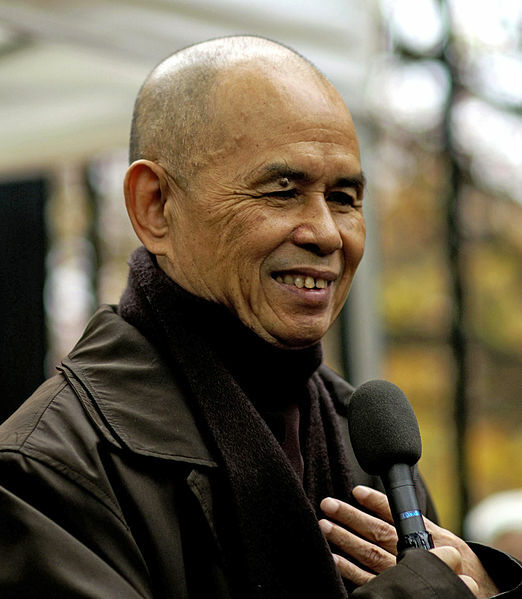 Thich Nhat Hanh notes that the word nirvana originally meant (among other things) “the extinction of all notions.” Given the profusion of thoughts that can cross our minds in an hour’s time, the extinction of even one pernicious thought may seem a lofty aspiration. But we can start by becoming fully aware that we are having that thought–and by calling it a notion. * Thich Nhat Hanh, Beyond the Self: Teachings on the Middle Way (Parallax, 2010), 8, 16, 12. * Stan Carey, “Not a Notion about Irish Notions,” Sentence First. * Joseph Goldstein, Mindfulness (Sounds True, 2013), Kindle edition, 268.